Approximately every 778 days (roughly 2 years, 50 days) our planet over takes and passes Mars. This occurs on April 8, 2014. Earth revolves around the sun every year (365.25 days). Mars revolves once every 687 Earth days ( 1.88 Earth years). Because Mars travels a longer path around the sun and it moves more slowly in its orbit because it is farther from the sun, Earth takes an additional three months to catch and pass Mars. As our planet catches Mars, it appears to back up in its path. As Mars moves through its orbit, it appears to move eastward compared to the starry background. 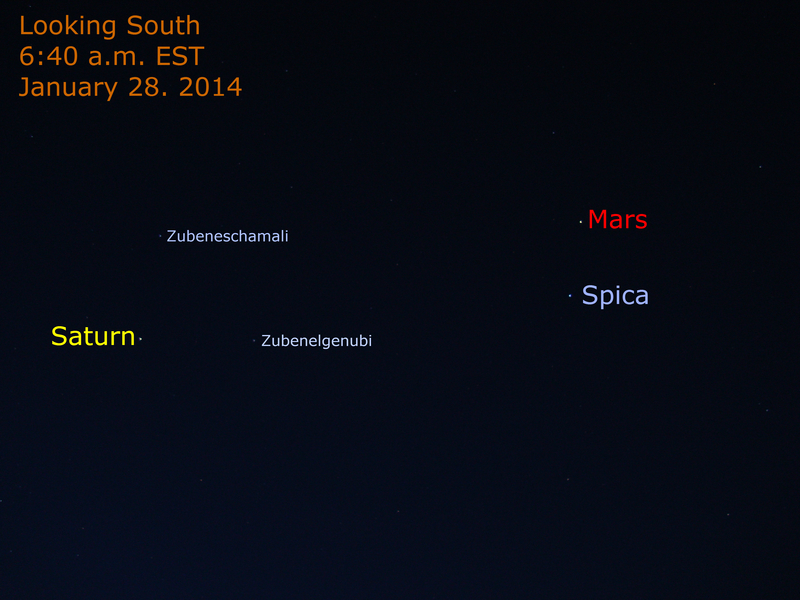 Each day, Mars rises in the east and sets in the west as seen from the skies of Earth. 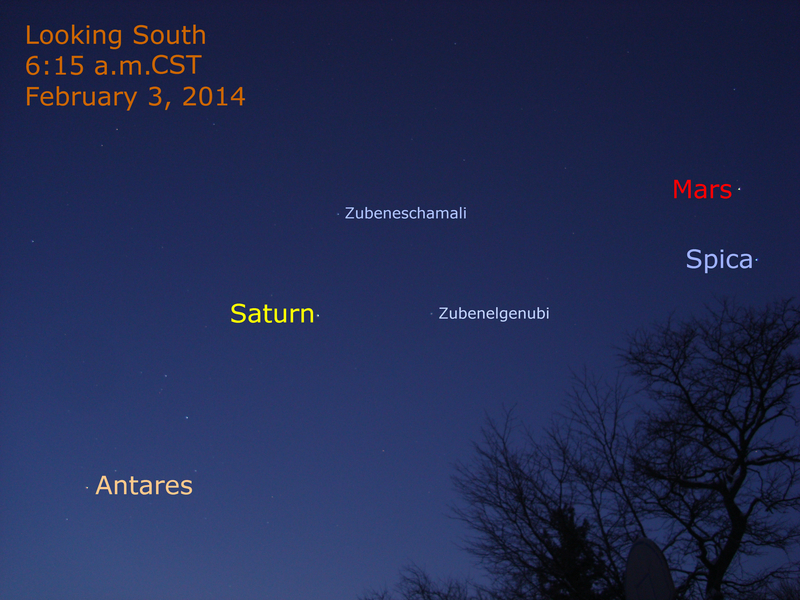 Each month, the starry background along with the planets appear farther west when observed at the same time. 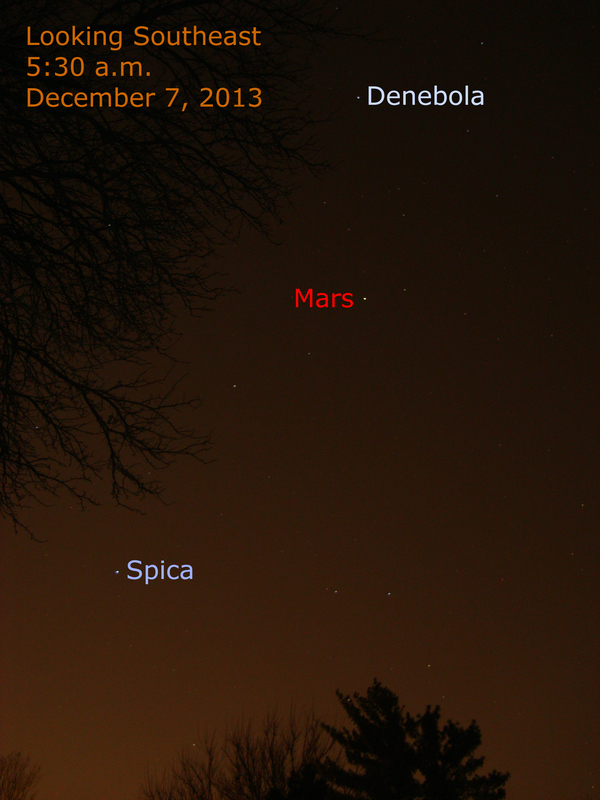 Notice the position of Mars relative to the star Spica on December 7, 2013. And compare them on February 14, 2014. (Click the images to see them larger.) Mars moved eastward compared to the starry background. On March 1, Mars appears to stop its eastward trek and begins to move westward (retrograde). On the chart above, each dot represents 10 days. Mars begins retrograding. As we approach Mars, it appears to brighten, nearly doubling in brightness, which is at maximum on April 8. At this time Earth is between Mars and the sun. Mars is on the opposite side of the Earth from the sun (opposition) and it is nearly 58 million miles from us — about 2,400 times the moon’s distance. At opposition, Mars rises in the east at sunset; appears south at midnight; and sets in the west at sunrise. Afterwards, Mars is well placed in the evening sky for viewing, although the best telescopic viewing are a few weeks around opposition. 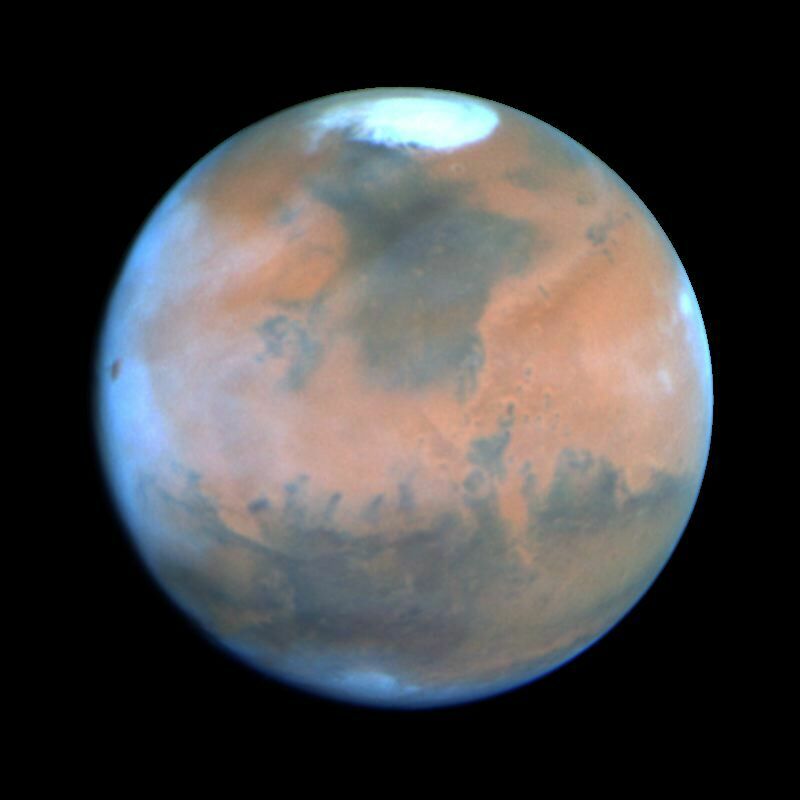 After opposition, Mars continues to retrograde grow dimmer until our planet is well passed Mars. Mars appears to reverse direction, going eastward again. 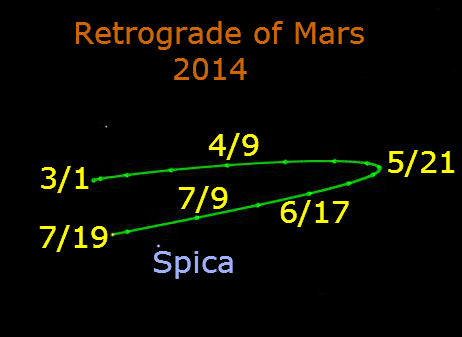 Mars passes Spica twice during the weeks shown on the diagram above. 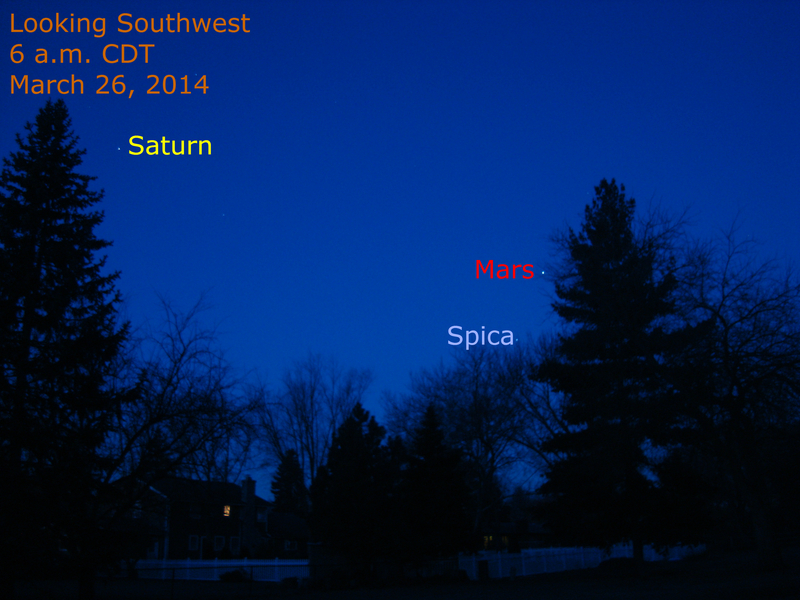 Mars passes Spica again on March 24 ( 5 degrees) and July 13 (1.3 degrees). 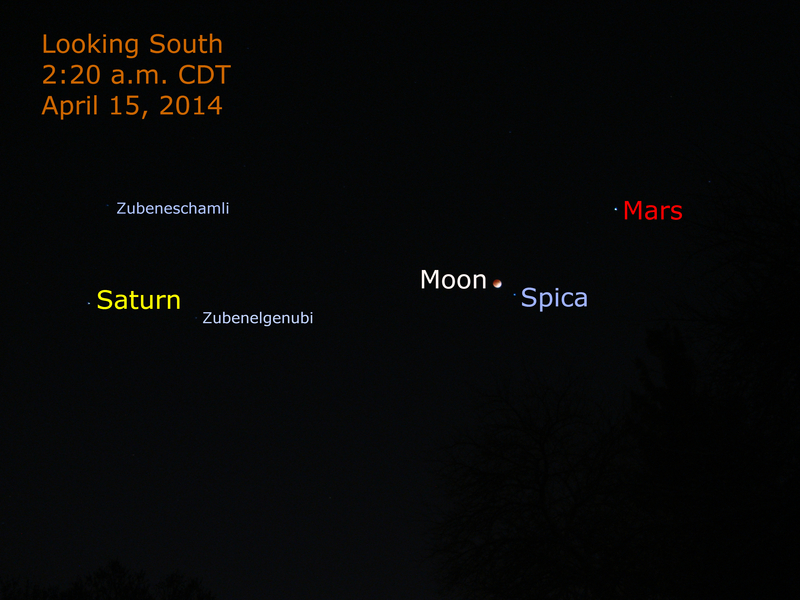 The moon and Mars were near each other during the lunar eclipse on April 15, 2014. 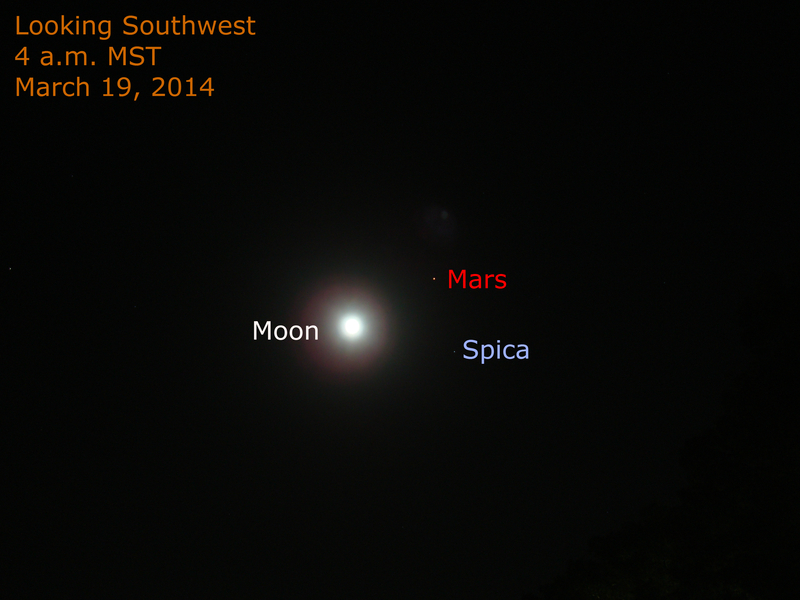 Click the image to see the eclipsed moon, Spica, and Mars. Capture Mars in the sky with a camera mounted on a tripod. Use the camera’s time exposure setting to capture images. Set the exposure for 5-20 seconds. This posting will be updated with images during this time.